According to rumors, Microsoft is working on ‘Windows Lite’ to target Chromebooks in the education sector and make dual-screen devices happen. Windows Lite is a flavor of Microsoft’s long-rumored Windows Core OS and it will power a wide range of devices, including foldable laptops, 2-in-1s and the traditional laptops which are affordable. Windows Lite could come with a brand new user experience that would be lightweight and flexible. As per initial reports, Windows Lite has deep ties with web experiences and it will natively support the Windows Store apps, PWAs. This new operating system could also support Win32 program in a slightly different way. Microsoft is said to be looking into multiple solutions that would allow devices to run Win32 application in Lite OS, including cloud solution and virtualization. 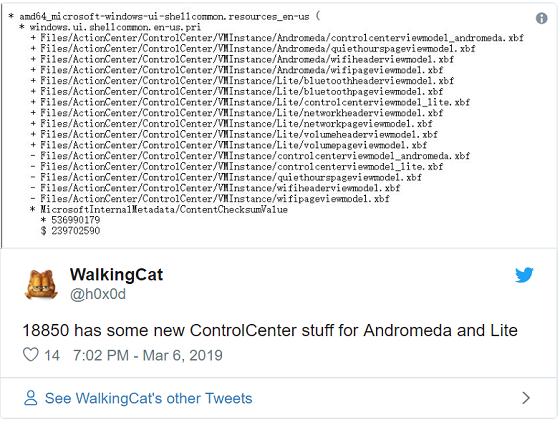 Watcher Walking Cat has now discovered mentions of Windows Lite, Centaurus (the foldable laptop) and Andromeda in the recent preview builds of Windows 10. The first finding details Control Center stuff for Andromeda and Lite. The second discovery has mentions of Centaurus, Andromeda), Lite, Polaris etc, suggesting that Microsoft is actively working on these kinds of stuff. Windows Lite is expected to create a new product category featuring dual-screen devices and it may also power the company’s foldable mobile device. Initially, Windows Lite will run on foldable PCs, 2-in-1s and tablets to deliver a brand new experience.